I placed an order a few weeks back with what has become a favorite local wood shop. I first learned about this place, ironically, through Siri - halfway across the country - when she posted her source for wooden acorns in this post (which I still refer to often for all of its acorn goodness). 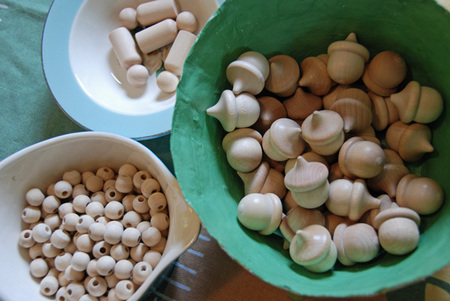 We were running low on our wooden acorns - they are often given away, lost, and otherwise disappear. Which means they're played with. A lot. 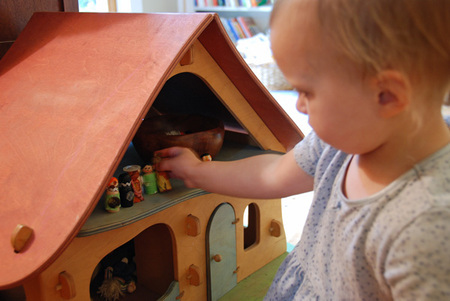 They become little people, pieces in homemade games, treasure, tokens, money, food, and so many more things. Sometimes - like with most good toys - they're put away and forgotten about for a time, but they always reappear in the play eventually. So we replenished our stock - a fresh bowl full of dozens of them. Sometimes we mix them in with bowls of 'real' acorns. Ah. I will admit to just running my fingers through the bowl often, turning them upside down. Like a salad. A mixed acorn salad. With this order, I got a few wooden beads too, for a project Calvin's been asking me about. And some wooden people, as well. 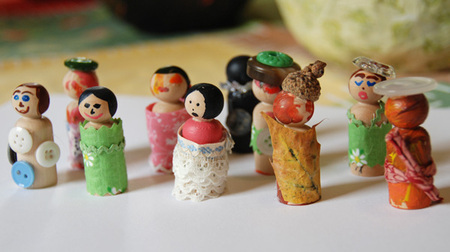 Though I made an error in ordering the wrong size - these are super tiny at just 2 inches tall, which makes painting features a little tricky (Ezra declared on many of them, 'this one doesn't need any eyes!') But still - the kids thought they were fab - to paint, dress, and decorate. Adelaide thought they all needed a hat - a pink (all the colors are 'pink' by the way) button hat. And now - a bowl of these 'people' become another tool for what will amount to - in the end - hours of creative play. What I love about them is that they're blank canvases, really. Blank canvases for imaginations to run wild with, and that they do. I've been reading some of the news accounts about the mass toy recalls, and I get a little bummed when the story ends with the bit about wooden toys all being so expensive as an alternative to plastic. 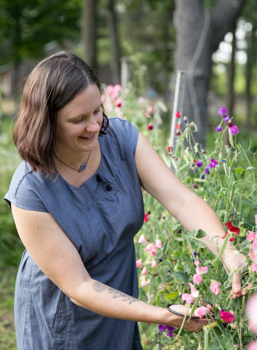 If you're really looking to have less plastic and more natural materials, it really needn't be so. Sometimes, we do chose to spend a little bit extra to have the toys/tools we like best - those that come from natural materials, those that leave room for imagination, and those that are made in a way that fits our values - but that also means we buy less, evening the cost in the end. Buying less also means we have less - which I believe is always more when it comes to toys and imagination and the growth of our little ones. But there's also all this other stuff - this 'free' - and yet incredibly valuable - stuff out in the world - rocks, leaves, acorns. Cardboard, newspaper and wood. And all the incredibly inexpensive stuff - paper and crayons and paint. 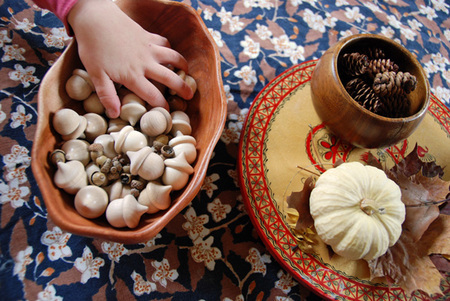 And wooden acorns and beads and cubes and eggs and hearts. I mean, really, all of the above cost me less than $12. What would I get walking into a big toy store for $12? I'm just sayin'. Acorns are fun.